1. Kavyakantha Ganapati Muni was a great yogi and a mystic poet and one of the early devotees of Bhagavan Ramana. Bhagavan and the devotees affectionately referred to him as Nayana. 2. Sri Murunagar is well known to Bhagavan devotees. He was the great poet who came to Bhagavan for the first time bringing a poem he had written to read to Bhagavan. However, upon seeing Bhagavan for the first time, Muruganar could not utter a single word. Bhagavan then took the piece of paper from Muruganar and read his poem. From that point, everything fell away from Muruganar and he became known as Bhagavan’s shadow. 3. Vishwanath Swami who narrates this wonderful story, was the son of Bhagavan’s elder cousin. Now the story as told by Viswanatha Swami. I have made some minor edits for clarity. Ganapati Muni once told Bhagavan Ramana that he had seen many other forests, but not the one at Arunachala. 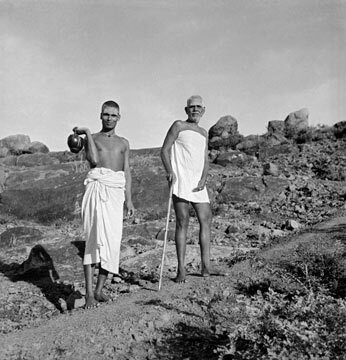 Bhagavan, who knew very well every inch of Arunachala, offered to take the Muni one day into the interior of the forest. Ganapati Muni could not bear even the slightest heat of the sun on account of a yogic experience he had, known as Kapalabheda (breaking of the skull), and so Bhagavan waited for a cloudy day. Such a day came soon and Bhagavan asked me if it would suit Nayana (Bhagavan referred to Ganapati Muni affectionately as Nayana) to go into the forest then. I replied that he would gladly jump at the opportunity and went ahead to his room to inform him of Bhagavan’s intention. In a few minutes Bhagavan came to our room in Palakothu and we three set out. Bhagavan took us through the third forest path. After going for more than a mile, Bhagavan chose a cool and shady spot adjoining a huge rock to rest a bit. As we were sitting there a rustling sound was heard indicating someone was approaching, and in a minute, Muruganar stood before us. Bhagavan put his finger on his nose and asked him with surprise: “How did you come here? Even a forest guard could not have found us here”. Nayana (Ganapati Muni) patted Muruganar and said: “It is an indication of how you are attuned to Bhagavan by his Grace.” And we returned to the Ashram before 4 p.m. I am thrilled when I recollect my intimate contact with Bhagavan and these two great poet-disciples of his.